One of the finest Surplus Commando Sweaters we've ever offered. The materials and craftsmanship are absolutely topnotch. Soft virgin wool looks stylish, while delivering traditional moisture-wicking warmth in just about any environment. Get yours while this deal holds out! British Military Surplus Commando Wool Sweater, Olive Drab, Used is rated 4.3 out of 5 by 53. Rated 3 out of 5 by ChiefV16 from Authentic used British commando sweater This is the real deal. It’s a very cool piece of gear and will be great for an inner or outer layer depending on weather conditions. It’s listed as being surplus, used. This is true. It smells like old storage and mine has several nickel sized holes on the sleeve above the left wrist. The size runs very small. You essentially need to be in military condition for this to fit properly. I have a few extra pounds, and the Large size looks like I’m trying to wear children’s clothes. I guess I need to pick up my PT so I can really enjoy this sweater. Rated 4 out of 5 by wingz38 from Great price! Bad sizing as usual The quality of these British sweaters is absolutely top notch. I have one that is over 25 years old and still in near perfect shape. The problem is the same problem Sportsman's Guide has had for years now...SIZING!! Nearly anything European is not sold in the correct size category. I ordered a size Large... The tag says it is Size 100cm which according to most charts I've read is an American size Small. My old sweater is a 112cm (American Size XL) and fits perfectly. Rated 3 out of 5 by Bob71 from A warm sweater Sweater is worth the price and almost new condition. The one I received has no reinforcement patches though which would have been nice. Rated 5 out of 5 by D I Wyer from Warm! Sharp! Very warm, heavy wool. Fit is slightly small. Very good looking sweater. Considering the high quality and the price, it's practically a steal! Rated 5 out of 5 by oldedude from Wonderful Sweater/Great Price This is THE "Classic". The Brits invented these "commando" style sweaters (back in the day when the patches were canvas instead of nylon) and now everyone wears them - why? Because they are just a great sweater. The patches are strategically located at the wear and stress points and the sweater is warm and comfy. I also own one of the USMC ones, also in OD, but this one is a slightly lighter color and lighter knit, good for those days that are not quite as cool as the ones for which the USMC version is made. Fit and quality is first rate (I do wish the Guide would get more Brit military surplus, esp. 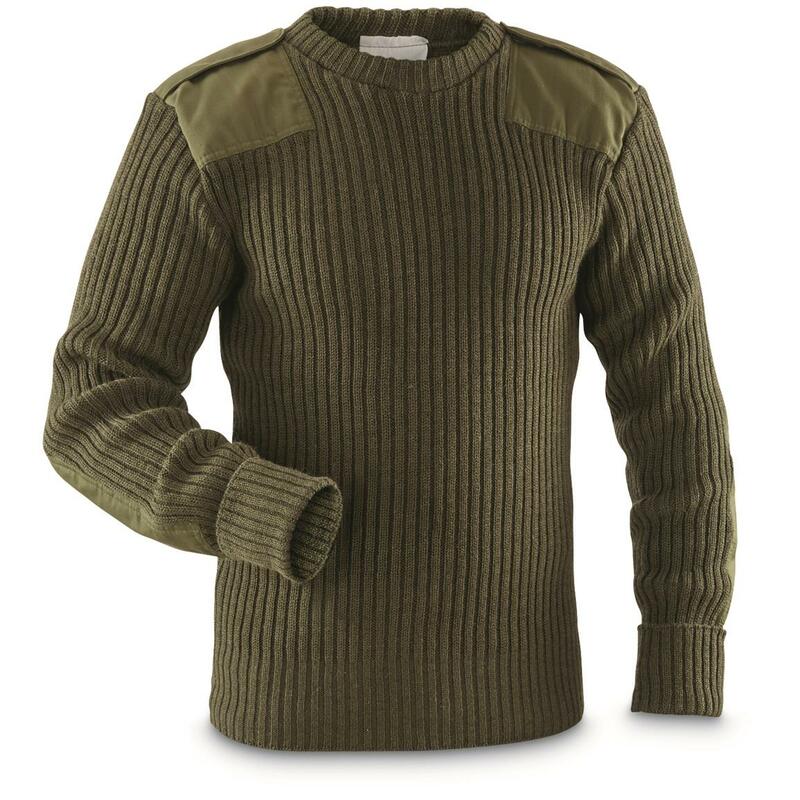 their shirts with the epaulets - I bought 8 each of the khaki and the green and I've been slowly wearing them out for the last 16 years - they are the perfect mate-up with this sweater). Sizing is fairly accurate - "medium" is "medium" if not quite as capacious as the comparable American size (i.e., if you are puttin' on the pounds and still pretending you only wear a medium, buy a large. If you really are a medium, buy a medium). A great sweater for a great price.